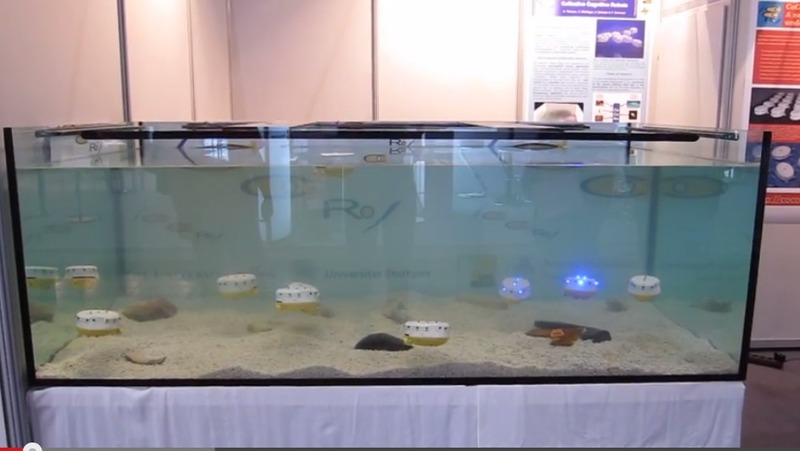 The EU-funded Collective Cognitive Robotics (CoCoRo) project has built a swarm of 41 autonomous underwater vehicles (AUVs) that show collective cognition. Throughout 2015 – The Year of CoCoRo – we will be uploading a new weekly video detailing the latest stage in its development. This video shows the CoCoRo autonomous underwater vehicles (AUVs) in a large aquarium at the CeBIT exhibition, and simulates a real mission scenario in which the AUVs have to collectively find an object of potential interest at the sea floor (e.g., a black box of a crashed plane). In the beginning the AUVs start randomly distributed in the mission area (= aquarium) where the object is assumed to be. The AUVs do not perform a special search pattern but instead use a simple random walk. Due to the high number of AUVs, quite soon one of the AUVs will be near the object (in this case a magnetic target) and can perceive it. The AUV then tries to keep its position above the object and starts to emit blue-light signals that attract other nearby AUVs which in turn also emit blue-light signals. This leads to a fast aggregation of most of the swarm AUVs near the object. In future underwater swarms these AUVs could then collectively grab and lift the object to the water surface. To learn more about the project, see this introductory post, or check out all the videos from the Year of CoCoRo on Robohub.